Heleana Backus is a senior at Seward High School and she has been an integral part of the 2017-2018 ELA curriculum revision process. Her work on the committee is helping to ensure the Kenai Peninsula Borough School District moves toward even more meaningful opportunities for student growth and personalized learning, work which will impact students long after her own graduation. Heleana joined the 2017-2018 ELA curriculum committee as a student representative. She attended every meeting, took time to ask questions and dig into the data alongside the other committee members, and engaged in difficult discussions about effective teaching and differing philosophies about students’ academic needs. Heleana remained open-minded, courteous, and professional, even as she stood her ground and brought up the challenges she and her peers are facing in and out of school. She worked tirelessly to remind her teacher colleagues on the committee about the modern society all KPBSD graduates are preparing to join, and to advocate for a broader and more applicable focus on the state’s ELA standards. The work that she is contributing to will be the foundation of the English-Language Arts learning for secondary students in KPBSD. And for being a student, Heleana far and away contributes integrally to the advancement of learning in our district. Additionally, Heleana jumped right into the creation of district curriculum documents, learning the new format, expectations, and professional vocabulary necessary to complete the task. She pushed herself beyond her comfort zone again and again, all while communicating clearly when she needed assistance and when she was prepared to continue her work independently. She, like all the teachers in the curriculum committee, was assigned specific deadlines and expectations for work quality, and met those standards time and time again. This work on the committee translates to an entire school year of dedication to this work by her. Heleana’s willingness to explore the depth of the educational field and to participate in creating a strong foundation for future students make her an excellent young leader who goes above and beyond. Her work will leave a lasting impression in our district and help guide our district’s growth and improvement for many years to come. Miss Backus has professional aspirations of becoming an educator that she is actively pursuing with her work on the committee. Her vision is best shared in her own words, “I push myself towards my goals with this constantly in mind: conformity can no longer be taught under the guise of public education. I am actively helping to integrate this idea into the classroom with the ELA curriculum committee, but I want to take that further. I strive to bring the vision that the Kenai Peninsula Borough School District has for personalizing education to every school.” We can only hope to have many more students taking this type of initiative to drive the education that they want to see for themselves, and those that come after them. 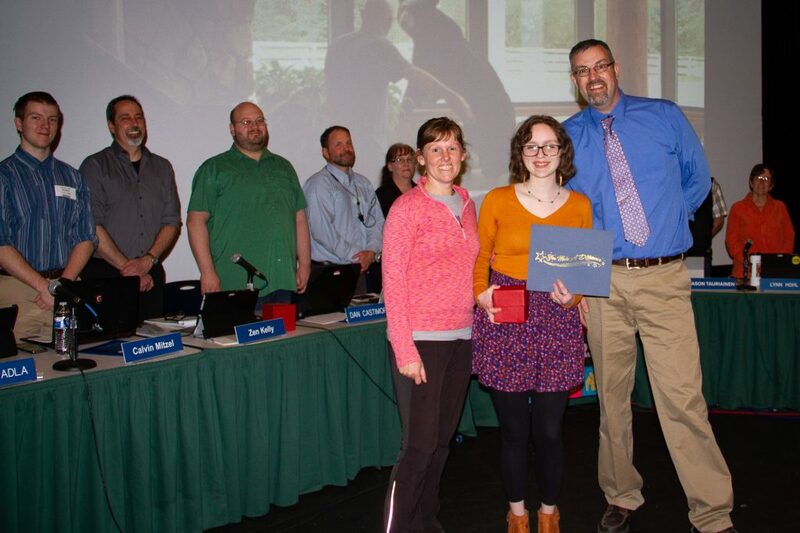 The Kenai Peninsula Borough School District Board of Education is proud to recognize Miss Heleana Backus for her leadership and dedication to education for the students of the school district, now and into the future. This entry was posted on May 7, 2018 at 7:30 pm. You can follow any responses to this entry through the RSS 2.0 feed. You can leave a response, or trackback from your own site. 1 Response to "Seward student Heleana Backus awarded Golden Apple"